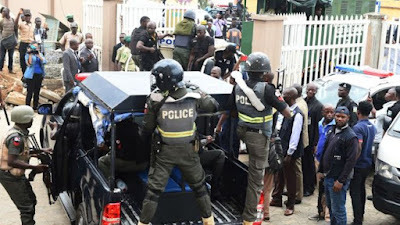 The police have recovered the bodies of 16 policemen killed during exchange of fire with bandits in Zamfara State last week Thursday. Twenty policemen who were missing during the operation, were reportedly rescued by the Police Joint Intervention Force. The Force Public Relations Officer, DCP Jimoh Moshood, had earlier claimed that only one policeman was killed. But a statement on Wednesday by the Zamfara Police spokesman, SP Mohammed Shehu, put the casualty figure at 16. “The search and rescue operations embarked on by the Police Joint Intervention Force to rescue the missing police personnel after the 29th November, 2018 onslaught on the armed bandits resulted in the successful rescue of 20 policemen alive, while 16 personnel were found dead,” it explained. The statement conveyed the condolences of the Inspector-General of Police to the families of the slain policemen, stating that he had ordered befitting burials for the gallant men and the prompt processing and payments of their life assurance benefits and other entitlements.